Here’s a healthy smoothie you need to try on a hot summer’s day here in Dallas! My mom made this the other night for dinner in her brand new Vitamix blender. The recipe came with the instruction book in her new blender. 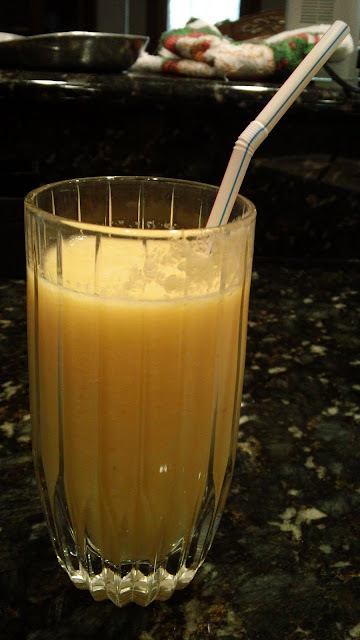 This Mango Delight Smoothie was cool, delicious, slightly tart, and overall sweet in flavor. My favorite fruits are actually apples and mangos, so this smoothie is right up my alley! I would have loved to have this smoothie after our kickball game this evening when it was 95 degrees at 7:00 pm at night! What a cool and healthy treat I would have loved sipping on after our 7-6 win over an undefeated team that has not lost a game in 7 years! Our kickball team broke their winning streak! Place all ingredients into the Vitamix container (or blender) in the order listed and secure lid. Blend for 45 seconds, or until desired consistency. Deborah's White Sangria and Happy 4th of July!